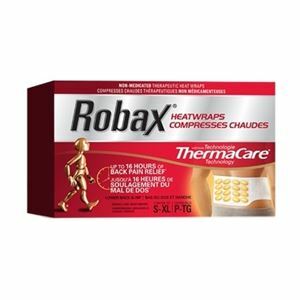 Robax HeatWraps are with Thermcare Technology which works on patented heat cells that use controlled heat with therapeutic effect that relieves back pain for up to 16 hours. ThermaCare heat cells use a mixture of ingredients which when exposed to air or oxygen provides controlled heat for 8 hours which in turn provides relief for up to 16 hours. These HeatWraps also helps relax muscles. Once the HeatWrap is opened, the therapeutic temperature which is 3 degrees above the body temperature is reached within 30 minutes. Robax HeatWraps can be used for 8 hours each day for 7 days consecutively. Activated charcoal, iron powder, sodium chloride, sodium thiosulfate, sodium polyacrolate, and water. HeatWraps can cause burns especially if you are 55 years of age or above. Skin gets sensitive with age and HeatWraps should not be placed directly on the skin. If Heat cells come in contact with your eyes or skin, they should be washed immediately with water and if some signs of burning or irritation are noticed then a doctr should be seen without a delay. Heat cells contain iron, hence if ingested, the mouth should be washed and rinsed with water and poison control center should be contacted imediately. HeatWrap should not be heated in a microwave and should never be re-heated to avoid fire. It should be kept away from the reach of children and pets. People suffering from high blood sugar, heart problem, arthritis, poor blood circulation, pregnant women and lactating mothers should consult their doctor before using this product. If during or after use any burning, pain, discomfort, inflammation, rash or change in skin color is noticed then a doctor should be consulted.